Felix Baumgartner cheers after a perfect landing (Credits: Red Bull Stratos). On October 14, Felix Baumgartner successfully leapt from a helium supported capsule at an altitude of 39,045 meters. 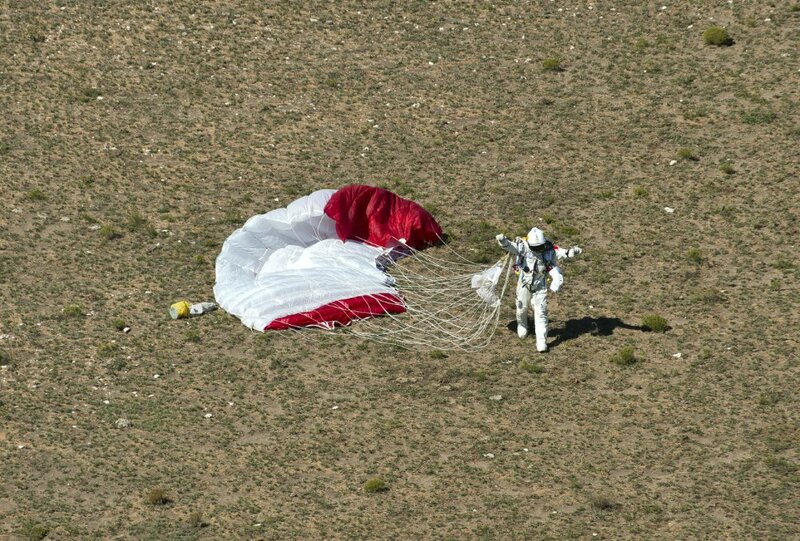 Over the next 9 minutes and 3 seconds, Baumgartner broke at least three records as he fell, broke the speed of sound, deployed his parachute, then gracefully and gently set down on the ground in Roswell, New Mexico. “It was really a lot harder than I thought it was going to be,” said Baumgartner once safely back on the ground. Baumgartner experienced a few tricky moments when he went into a spin coming out of the capsule and later when his visor fogged up, an issue that had ocassioned a brief discussion whether to abort when it occurred in the capsule on the way up. Due to the spinning, which can be fatal if not quickly brought under control, Baumgartner did not hear the sonic boom when he broke the sound barrier. Only later did he find out his fastest speed, a recordbreaking 1.24 Mach. Baumgartner jumps! (Credits: Red Bull Stratos). Baumgartner was supported by a 300-odd Red Bull Stratos team, including his predecessor and mentor Joe Kittinger on Capcom. Kittinger talked Baumgartner through procedural drills throughout the latter’s three hour ascent, keeping him focused for the big moment. There seemed to be a few communication issues throughout the mission. Reception from Baumgartner degraded just before he left the capsule, with confirmation of the last few procedures being made by the BASE jumper’s thumbs up in lieu of verbal statement. Baumgartner’s message to the world was also hopelessly garbled. On the way down, Baumgartner reported his visor fogging several times without response from mission control, and he later received incorrect wind direction information and had to repeatedly request a flare when trying to identify a good landing spot. Baumgartner’s friends and family watched the live feed from mission control, celebrating each milestone with waves of cheering. Baumgartner’s mother Ava seemed particularly relieved to have him safely back on the ground, after sitting through tense momemnts of the mission with fingers, arms, and legs crossed for luck. The historic jump had been delayed a few times due to hardware and weather issues. But the final date seemed preordained, as it coincided with the 65th anniversary of the first occasion of a human breaking the sound barrier. On October 14, 1947 US Air Force test pilot Chuck Yeager flew the experimental Bell X-1 at Mach 1. 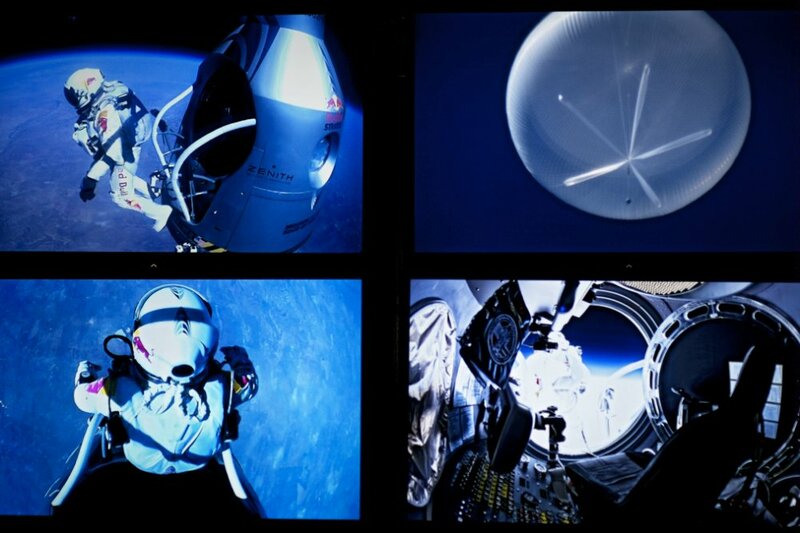 Baumgartner is now the first human to achieve Mach outside of a vehicle. One record Baumgartner didn’t break is that of longest free fall. Although his free fall covered a greater distance than Kittinger’s, Baumgartner also travelled faster than his predecessor. As a result, Baumgartner’s 4 minutes 19 seconds of free fall prior to pulling his parachute came 16 seconds short of the record.